"James Sullivan (1744-1808) was an author, lawyer, and Governor of Massachusetts. Sullivan was about equally a lawyer, author, businessman, and politician, and very busy at each. He was born of Irish descent at Berwick, Maine, April 22, 1744. He stood high among the legal lights that came forth in New England toward the end of the century. During his seventeen years' service as Attorney-General, he conducted many of the admiralty, probate, superior and supreme courts; in addition, he had a heavy private practice. As an author, he showed marked ability in the writing of law works, political tracts, and constant contributions to the political controversies of the press. In public life, besides serving on various commissions, he acted as representative, member of the council, delegate to Congress, and, after several close campaigns, was in 1807 and 1808 twice successful as Republican candidate for governor, dying before the end of his second term. He was one of the incorporators of the Middlesex Canal and largely instrumental in its final building. He helped found the Massachusetts Historical Society and was its first president. He was exceedingly active, high spirited, eloquent, and hospitable, and was popular even with his Federalist opponents in times when party feeling ran high. 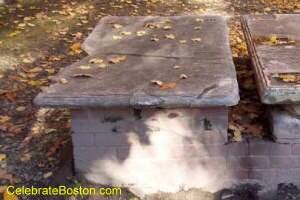 Sullivan was interred at Granary Burying Ground in Boston. His tomb is adjacent to that of Richard Bellingham, in the northwest corner of the cemetery (far right corner from the front gate). His Remains are Here Deposited. he was distinguished for zeal, intelligence and fidelity. citizen, and eminently respected as a magistrate.